Great band Cautiontape + great game Bloodborne = music video idea. Music video for Austin, TX based band Cautiontape's song “Get To Me” made up entirely of gameplay footage from From Software’s 2015 PS4 game of the year contender, Bloodborne. Video consists of two female protagonists (one of which is a likeness to Cautiontape singer Britani Woods) trying to reconnect but nearly missing each other throughout the city of Yharnam and the ethereal Hunter’s Dream paradise. In doing so, they face a few bloody challenges. All footage captured is in-game with manual camera manipulation to create scenes. Several deaths occurred in the making of this video. Cautiontape is Austin’s newest purveyor of indie pop, rock, electronica and New Wave. Britani Woods' seductive yet pleading odes to lost and potentially lost love soar over Jason Garcia’s layered keyboard hooks and harmonies and the rhythm section of Asher Alexander (drums) and Matthew Bell-Roberts (bass) anchors them in a solid groove. The band’s tunes are reminiscent of Metric and The Sounds, with a nod to past pop pioneers The Cardigans, Fleetwood Mac and The Cars, and the style and flair of each individual in the band come together in an exciting live show. One of 2015’s highest rated games, Bloodborne (ブラッドボーン Buraddobōn?) is an action role-playing video game directed by Hidetaka Miyazaki, developed by From Software, and published by Sony Computer Entertainment for the PlayStation 4. The game follows the player character, the Hunter, through the fictional Gothic city of Yharnam, whose inhabitants have been afflicted with an abnormal blood-borne disease. Upon mysteriously awakening in Yharnam during the night of "The Hunt", the Hunter seeks out something known only as "Paleblood" for reasons unknown. Cautiontape (the band) meets Bloodborne (the game) this Friday. 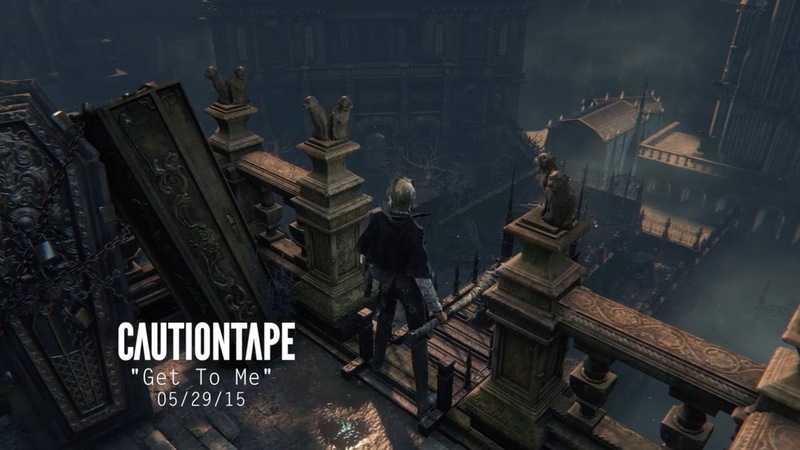 I love the band Cautiontape and I love the game Bloodborne....so I've decided to find an excuse to play a bunch of Bloodborne while listening to a killer Cautiontape tune titled "Get To Me". It was a bloody good time and it will be up Friday. In the meantime here are a couple screens. Two female protagonists based on the likenesses of the Britani Woods, the band's singer and Maureen Brown, the video maker's wife. Side One Track One Premiere's New Genuine Leather Video! Well my latest video just came out a couple minutes ago. Side One Track One premiered it and said some really nice things. Check it out here. The track is from an excellent Austin band called Genuine Leather and it's called "She & I". Hopefully you will enjoy it as well.